Pictured at the top is South Farm, located on the Cambridgeshire/Hertfordshire borders yet only 50 minutes from London, it is a lovingly restored Grade II listed country house. South Farm is set in 20 acres of landscaped grounds and beautiful gardens surrounded by a smallholding, the main house adjoins a courtyard of lovingly restored timber framed barns, granaries and stables. How beautiful are these caravans?? Love these flowers in a Milk Urn. 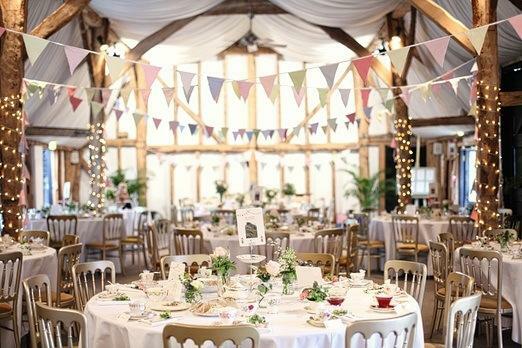 I was brought up in the country and although have now lived in London for more years than I care to remember, in my heart the country girl still lives on - maybe thats why I love these types of weddings so much... Farbridge in West Sussex (set on edge of the South Downs) has the most beautifully restored barns, perfect for making your Farm wedding. And the third wedding venue to highlight is the gorgeous Ramster Hall, a much loved family home where weddings are all dealt with on a very personal and intimate level. Set on Surrey, Sussex borders, it is not a farm but boasts fantastic gardens and is fanous for The Long Hall which is a magnificent beamed and paneled hall, built in 1604. It is over 100ft long with beautiful polished wood floors and a vast inglenook fireplace which gives a warm welcome in the winter.